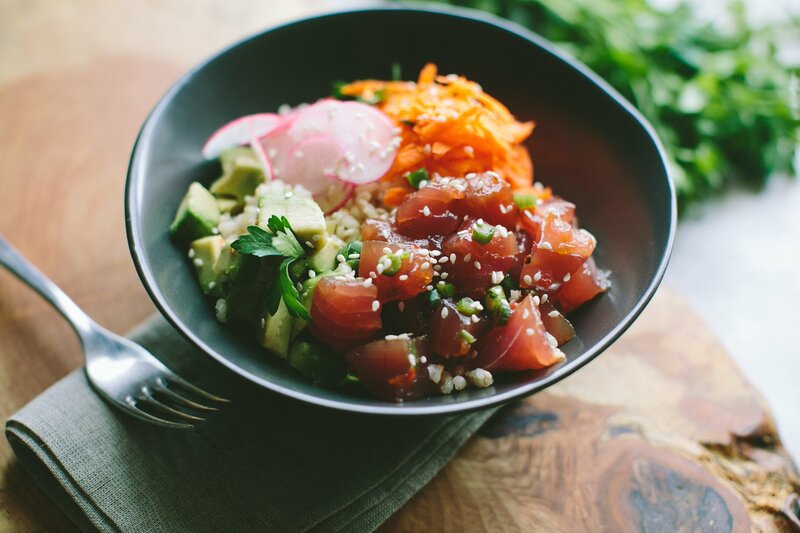 Poke bowls might be unfamiliar to many family tables across the Lower 48, but now is the time to start incorporating these delicious and nutritional recipes into your regular weeknight home cooking. While it can seem intimidating to work with raw fish and ingredients that you're not fully comfortable with, this is a great cooking skill that once you learn, you'll never stop using. So take a dive out of your comfort zone for these deliciously authentic poke recipes. If you'd like, think of poke bowls like deconstructed sushi. And just like sushi, this "new" trend is actually an old traditional dish that dates back centuries. In Hawaii, where poke bowls originated, you can find the varieties everywhere from restaurants to supermarkets, and for good reason: They're delicious, simple, and healthy. Poke is pronounced, poh-keh, and the word means "to cut." This aggressive verb, however, describes a delicate dish of raw, fresh fish (think: ahi tuna, salmon or shellfish) that are marinated and served cold over rice. The rice and fish are then seasoned with sauces like soy sauce, ponzu sauce, limu (seaweed), rice vinegar, Hawaiian sea salt, creamy and spicy mayo, and salty furikake. All accompanying ingredients are sliced and diced in bite-size portions. In Hawaii, different variations of this dish are not difficult to come by. Take a trip to virtually any grocery store in the Aloha State and you'll be greeted by a vast selection of the famous sushi-grade fish, like fresh tuna. Take a look through the butcher's glass and you'll see hi limu (yellowfin tuna with algae), spicy garlic salmon, tofu with soy sauce, sesame seeds, green onions, kimchee tako (octopus) for sale, and all prepared to top your poke bowls. Because in Hawaii, poke bowls are simple. Once they came to the mainland, however, poke bowls took on a whole new meaning gaining a variety of ingredients and losing those of their origin. Although there is nothing wrong with a little innovation, you're missing out if you haven't tried the real deal. Meat is not always a requirement, though avocado poke bowls are more of a health and wellness trend. So, to make sure that you are able to try the unadulterated original, here are 6 authentic recipes we love and always come back to. Just remember though, if you're going to make your own, buy the freshest fish available. The quality of your finished bowl will rely heavily on the freshness of the fish you use. If you're going to be working with in your own kitchen, be sure you're feeding your loved ones (and yourself!) the best possible quality. Simply, freshly dressed, and portioned to perfection, this very traditional poke bowl pairs best with a seaweed salad with a dash of sesame oil and red pepper flakes. Get the recipe here. 2. Spicy Ahi Poke + Avocado "Parfaitinis"
Should you need the perfect packed lunch to add to your weekly rotation, this is it. Get the recipe here. Add some vegetables to your diet and some color to your bowl with this poke bowl. These vegetables are traditional accompaniments to raw fish and rice, and you should definitely take a bite of the combination and find out why. Get the recipe here. Crab legs, avocado, tuna, green onion: This sounds vaguely like a deconstructed California roll. Get the recipe here. If you're worried about using tuna due to overfishing or its mercury levels, don't even risk it. Salmon sashimi is just as good, if not better, than its tuna cousin. Try it in a poke bowl and see for yourself. Get the recipe here. Poke bowls don't have to be only a raw fish salad. They can also have tofu, which is delicious, nutritious, and vegetarian for those Meatless Mondays. Get the recipe here.